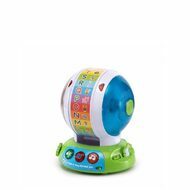 - Spin the interactive toy to learn about animals and letters. - Choose from three play modes including letters, animals and music. - Learn letter names and their sounds. - Includes 26 animal names and sounds. - Dance along to the ABC song or Old MacDonald tune. - Animal buttons help develop gross and fine motor skills.